The weather was cooler than forecast (cloudy due to the approach of Hurricane Nate down on the coast) with a high of 86º. They had 70 entries which wasn’t a bad turnout when you consider Cruisin’ the Coast had been held the previous week. Here’s a very nice 1923 Ford T Bucket. This 1972 MGB Sportster was modified with a 350 cubic inch Chevy engine. Here’s a 1933 Ford Street Rod with a front view of the 1960 Courier wagon. This was a very nice 1948 Ford 2-door Sedan. Here’s an impressive 1930 Buick 5-passenger Sedan. This 2010 Chevy Camaro was painted up as a Decepticon from the Transformers movies. My 1987 Olds 442. 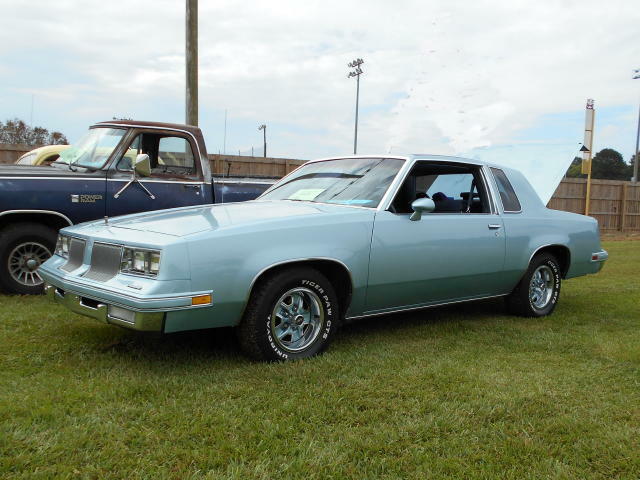 It received a 1st Place plaque that day - the 1986 Cutlass above received 2nd Place in the 1979 - 1991 Production Cars class that mine was in. For more car show photos, click here.